We are interested in the transport and metabolism of amino acids, betaines (e.g., L-carnitine) and ions (Na+, H+) in prokaryotes. Our major focus is on the structure and function of related membrane transport proteins. Beside crystallographic approaches and various functional analyses we use protein chemical and spectroscopic methods (e.g., electron paramagnetic resonance spectroscopy) to obtain information on the structure, structure-function relationships and dynamics of respective membrane proteins. 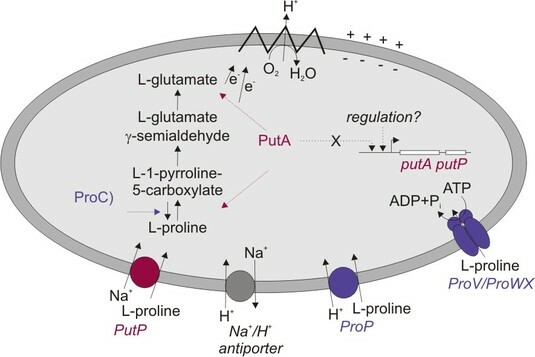 Among the proteins analyzed is the sodium/proline transporter PutP and the L-carnitine/g-butyrobetaine antiporter CaiT. In addition we investigate the physiological significance und molecular mechanisms of amino acid transport in the human pathogen Helicobacter pylori.